Combine the 2 wedges for a 45 degree wedge when necessary- must use stability tabs on both pillows and attach to crib slats or chair legs. Not to be done in a a Pack n Play. We have 4 harness sizes available so please refer to the measuring chart so you get the size most suited to your baby ( this product comes with the Medium harness).Harness sizes are not based on weight or age. The size is based on the length of the baby's torso. To determine which size is best for your baby measure from baby's bottom up to baby's chest (underarm height) since the harness goes accross the baby's chest. You can purchase a harness that is longer than this length and roll it downward. Do not use a harness that is smaller then this length. The purpose to crossing the chest is to keep the baby securely in place so that he/she does not sit-up or roll over. Due to the safety features built in -- particularly, the removable & adjustable head ring which safely and securely supports the baby's head -- especially preemies & newborns MUST have their little heads held securely!!!! -- AR Pillow products are designed with headrings (placed beneath the pillow sheet) with safety in mind! The ideal 30 degree angle (and 15 degree wedge when 30 is too high or 45 degrees is needed) -- many competitive products or alternative solutions use inferior angles in their design -- wedge designs with too small angles are a useless waste of money (ineffective at best). Cost effective -- the AR Pillow has a superior design with economies of scale built into the production lines providing an affordable natural solution for parents who want to help their babies to stop suffering. Additionally, some babies seem to take forever to grow out of their reflux -- this pillow has 4 different sized harnesses so your baby will outgrown his/her reflux before he /she outgrows our pillow. 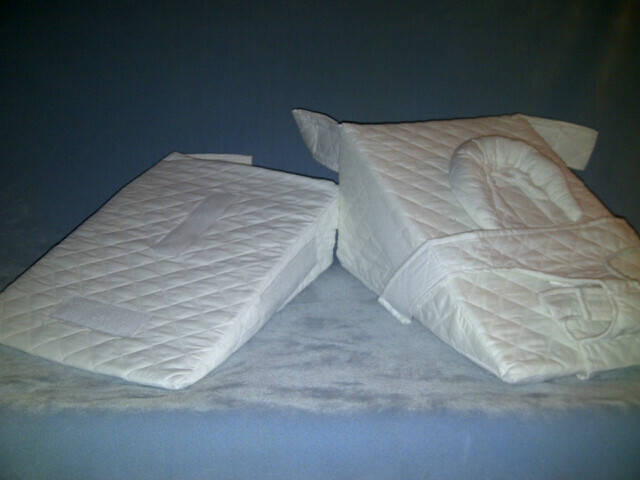 Additionally once the baby no longer needs the pillow the headring, harness and pillowsheet can be removed so that it can be used as a Child/Adult wedge for anyone in the family. Great for use when you have a cold, sinus issues, sleep apnea or post surgical elevation.